It’s April! The month of spring showers, fresh greenery, Easter eggs, and baby animals. And…it’s also National Grilled Cheese Month! I know, it sounds like some sort of wonderfully horrible April Fools joke, but no joke, it’s Grilled Cheese Month and you bet I’m going to celebrate! I am a grilled cheese lover through and through. Grilled cheeses are the ultimate sandwich form. Crispy, golden brown outsides and ooey-gooey insides equal perfection. True fact: I didn’t grow up on grilled cheese sandwiches. My mom never made them, probably due to a.) grilled cheese sandwiches aren’t remotely Chinese and b.) she thought butter was bad for us. Instead of grilled cheese she’d make toasted cheese sandwiches in our little toaster oven. Yes, they were cheesy and toasted, but without that buttery crisp outside, a grilled cheese cannot be called a grilled cheese. The real fun with grilled cheese starts when you change up the basics. Don’t have any bread but an abundance of English muffins? Perfect. I love using English muffins: they’re round, slightly smaller than regular bread and they have nooks and crannies that are perfect for extra browning. A grilled cheese made with an English muffin is a true revelation. An extra crispy, extra buttery, extra delicious revelation. And quickly sautéed brussels sprouts? They’re perfect in grilled cheese. Especially with bacon. 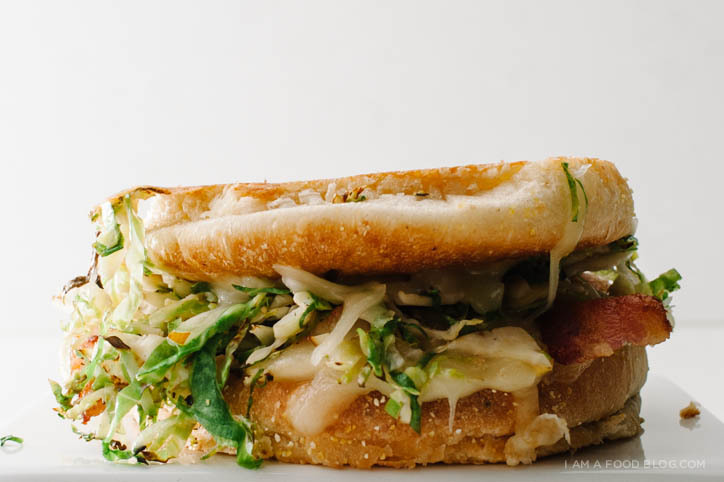 Even without bacon this sandwich is a winner. I’m sorry if I don’t sound remotely coherent. It’s just that April is off to a fantastic start! 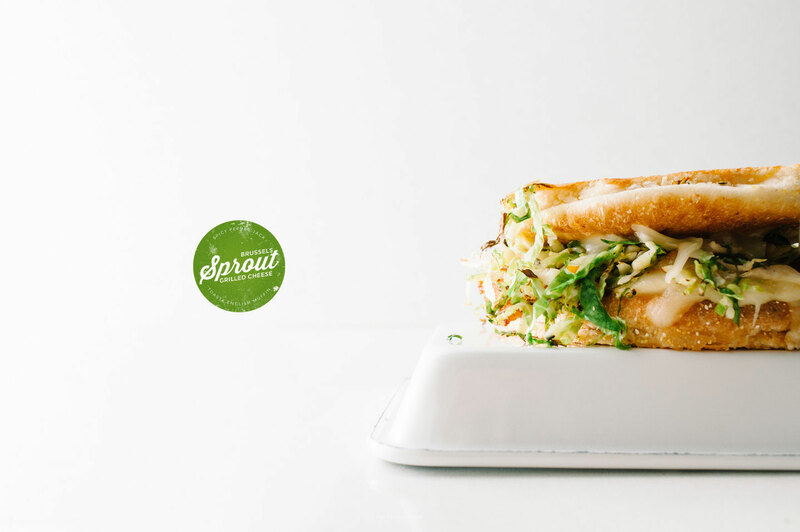 Yesterday I found out that I’m a finalist in Saveur’s Best Food Blog Awards of 2014! I am in some amazing company with some of my favourite blogs and it’s truly a dream come true. If you vote for me I’ll send you all the grilled cheese sandwiches you could ever want! Even if you don’t vote for me, check out some of the other blogs, there are truly some greats in there. Okay, I think it’s time to end this. I’ve used entirely too many exclamation marks. (Can you tell I’m excited?!) Go on, get out of here and go eat grilled cheeses and celebrate spring! Cook your bacon until it reaches your desired level of crispiness. For me, that means extra crispy with basically all of the fat rendered out. Drain the bacon on paper towels but save a bit of bacon fat, say 1 teaspoons worth to fry up the shallots and sprouts. Heat the teaspoon of bacon fat over medium heat in a small frying pan. If you’re not using bacon, add a tiny bit of neutral oil to your pan. Add the shallots and cook until slightly soft, about 2-3 minutes. Turn the heat to high and add the sprouts. Cook until slightly wilted and charred, about 2-3 minutes. Season with salt and pepper and remove from the heat. On a cutting board, butter the english muffin, on the inside cut side. The inside will become the side that you grill. Flip the muffins out so that the butter is facing the cutting board and then assemble your sandwich. Spread a wee bit (or a lot, if that’s you’re thing) of mustard on one muffin half. 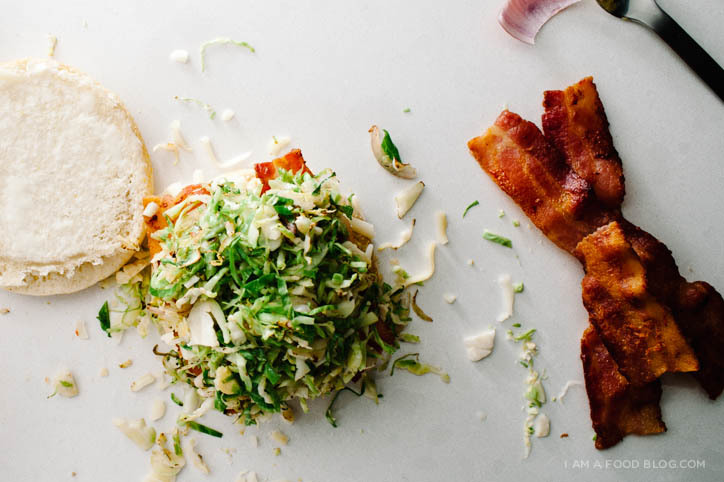 Top with half of the shredded cheddar, your bacon slices, the sprouts, and the rest of your cheese. Top with the remaining muffin half. Heat up a non-stick pan over medium heat and carefully move the sandwich to the pan. Fry until golden brown and crispy, flipping once. Enjoy immediately. Can’t get enough grilled cheese? Check out: Pierogi Grilled Cheese, Classic Grilled, Crab Rangoon Grilled Cheese, Grilled Egg and Cheese, Broccoli and Cheddar Grilled Cheese. I love how high you stacked the brussels sprouts!! This looks so good! What a unique twist on a grilled cheese. Great pictures! looks amazing. YEAH GIRL! this looks insaaaaaaaane! Good golly I am drooling! First of all, EXCELLENT flavor combo—sprouts may just be my fave veggies, but second, HOW HAVE I NEVER THOUGHT TO USE AN ENGLISH MUFFIN FOR A GRILLED CHEESE?! Yes, the all caps were actually necessary. Seriously, brilliant. omg Rachel, I hope you get your English muffin grilled cheese on soon!!! I don’t need an excuse to eat a grilled cheese, but a month dedicated to grilled cheese sandwiches sounds like the perfect reason to enjoy one. 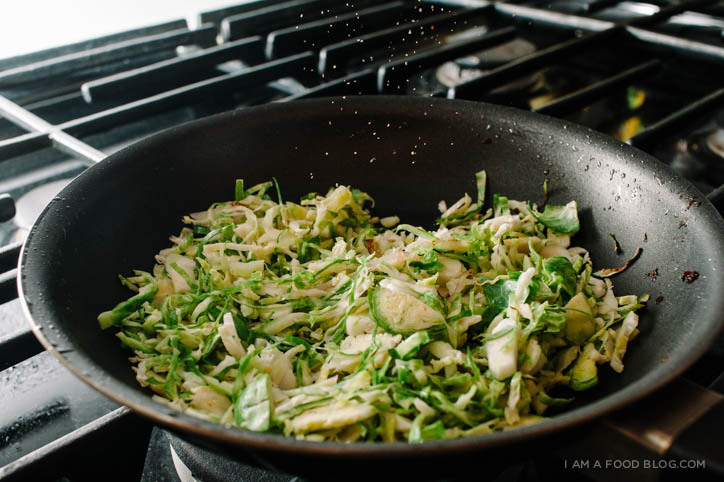 I love this Brussels sprout twist! I love this sandwich! It’s like a massive pulled pork sandwich tower except BRUSSELS! Wow. Congratulations on your nomination, Steph. This is one of my most-favorite blogs… you deserve it! 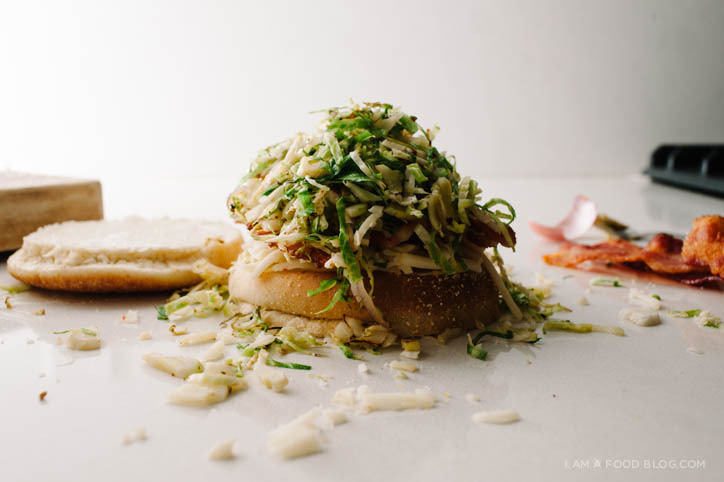 Hahaha, yeah now that I look at it, the massive pile of sprouts does kinda remind me of pulled pork. And thanks for the support Sophie! Seriously big congrats and Chookas (good luck!) 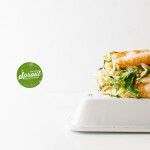 for the Saveur comp. 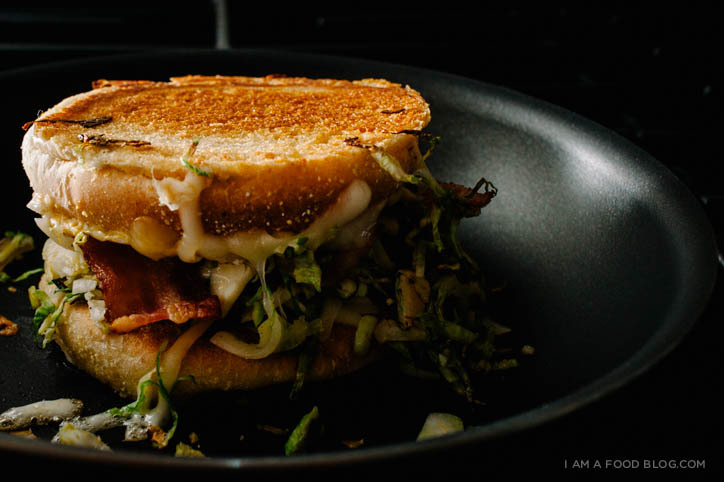 I love Brussel sprouts and I love grilled cheese. As far as I’m concerned, anything goes!!! I voted for you! How do I let you know where to send my grilled cheese sandwiches? I tried to vote for your blog (love it!) and receive an error message – any idea how to get around this? i would like to see you win (so deserving!) but it’s not going to happen if you can’t receive votes. Thanks for your support Gayla – it means a lot to me! Did you register/sign in? I love sandwiches and yours looks delicious! Congrats on the nomination! Thank you so much Meike! I need this in my life. Now. Right now. I love this recipe idea! I make a grilled cheese with roasted cauliflower but I would never have thought of brussel sprouts!!! It’s a match made in heaven. thank you! Why use shredded cheese over sliced cheese? This looks delicious! I like using shredded cheese because it melts faster. You can use sliced too, of course! Total Swoon! It’s like everything I adore stashed between a bun!